From 3 Star Studio, makers of the stylish ARC Dollhouse, comes a beautiful, airy dollhouse packed with custom design possibilities. Named after its iconic wing-like roof, the Butterfly Dollhouse is based on architecture first appearing in 1933 stylish mid-century building. This lovely and unique dollhouse is designed for play or display and can be customized in countless ways. 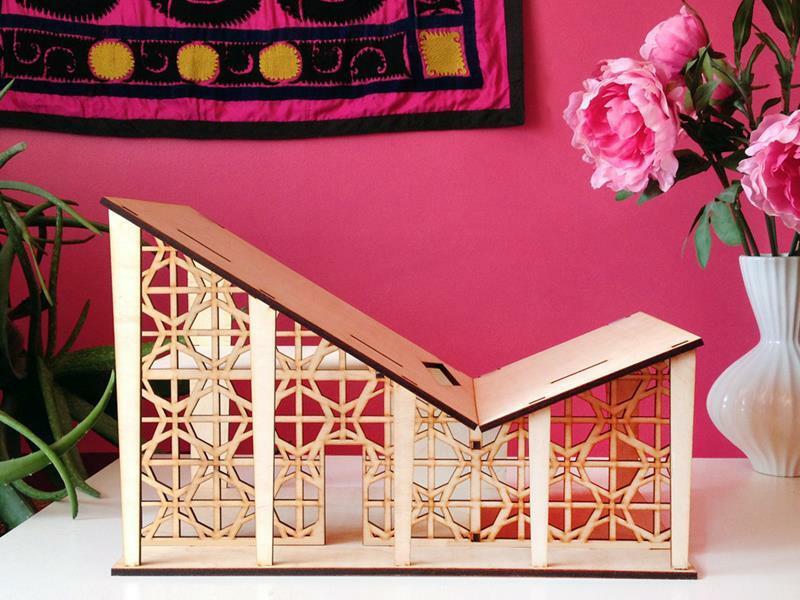 The USA made Butterfly Dollhouse is laser cut from sustainable Baltic birch plywood and arrives to you flat packed and ready for assembly. All you’ll need is a little wood glue — and simple notches allow for easy assembly and long-lasting strength. There are also two wonderful sets of furniture available for this dollhouse in either birch plywood or solid walnut. From 3 Star Studio, makers of the stylish ARC Dollhouse, comes a beautiful, airy dollhouse packed with custom design possibilities. Named after its iconic wing-like roof, the Butterfly Dollhouse is based on architecture first appearing in 1933 stylish mid-century building. This lovely and unique dollhouse is designed for play or display and can be customized in countless ways. The USA made Butterfly Dollhouse is laser cut from sustainable Baltic birch plywood and arrives to you flat packed and ready for assembly. All you'll need is a little wood glue -- and simple notches allow for easy assembly and long-lasting strength. There are also two wonderful sets of furniture available for this dollhouse in either birch plywood or solid walnut.